1970s: UNITED STATES: protesters carry flags through street in protest. 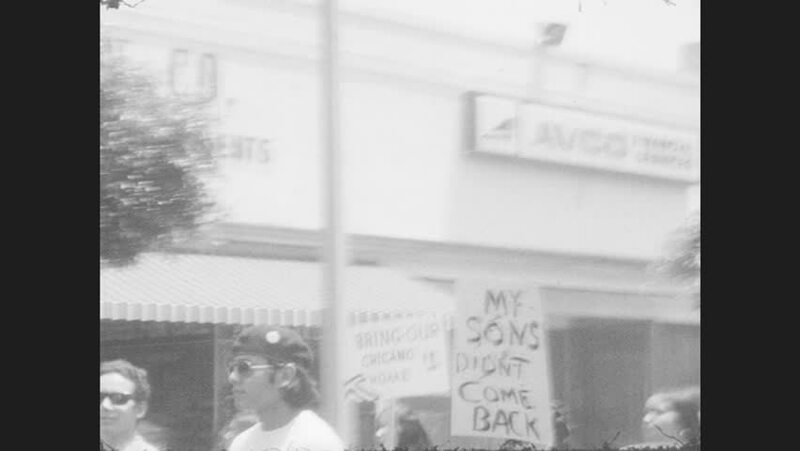 'My sons didn't come home' sign. 4k00:201930s: Horses pull carriage down street. hd00:241950s: Men stand on oil rig. Water rushes past. Tugboat. Man sits and writes. hd00:231920s: smoke pours out of buildings on street. horses pull fire engine as men in cars film chase. water sprays and rises on tied man in basement movie set as men crank camera. hd00:191960s: UNITED STATES: snow on tree. Bird looks for food on forest floor. Birds eat seeds. hd00:181920s: Man walks along train tracks. Man exits train. People wait on train. Train moves through mountains. 4k00:281940s: Fighter planes fly in formation. Jet attacks German bomber plane. Smoke trails from bomber and plane dives toward ground. hd00:211970s: Boy and girl look at wall of music records in store. Girl and boy talk to sales associate at lawn mower.